This past weekend I met a fellow farmer at a party. It's not too unusual these days, but it's always a pleasure, nonetheless. 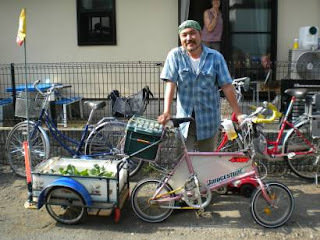 A neighbor of our hosts, Fuji-san* pulled up on his bicycle (a fantasy farm bike if ever there was one!) to drop off a handful of greens from his garden. Thick-leaved mizuna, frilly lettuce, and some pak choi that looked crunchy even from where I stood got a bevy of well-deserved 'oohs and aaah's' from the crowd, and an offer of a beer. Slipping off his shoes, he stepped into the party with his five-toed work socks (we all aptly admired them), and we started talking dirt. Fuji-san works a community garden plot not too far from where our friends live. A neighborhood dotted with more farms than ours, the area feels a bit more open and green. The majority of them are working farms with vegetable stands attached and outdoor work spaces strategically placed to take advantage of shade and cool breezes. Great towers of pea vines, knee-high sweet corn, fat green cabbages, joined by thick stemmed eggplants and tomatoes showing off their first flowers to great advantage basked in the noonday sun washing the fields. It's no wonder we gave in finally to buckets of rainbow hued snapdragon bouquets as a hostess gift. One can only resist for so long. It's not unusual as farmers age and find themselves putting the word 'urban' in front of their job title, that they turn their land into community garden space. 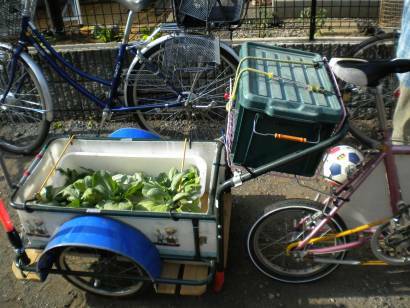 As Tokyo's population grows and spreads west, the demand for a little patch of land to garden increases. It's a nice way for farm families to keep the land in production and to share it with the neighborhood. It also, I'm sure, provides a nice bit of income on the side. Munching on assorted bits of grilled meat, salads, and potluck goodies, we shared our frustration with aphids (abura mushi), cabbage worms (midori mushi), and the challenge of gardening organically. At one point, he pulled a water and dirt stained notebook from his rucksack. Page after page of notes, diagrams, sketches, and lists it was his gardenjournal, and it was beautiful. Asparagus, potatoes (one of his favorites), tomatoes, shiso, eggplants, pak choi (another of his favorites), and lettuce fill the available space. We marvelled at the fact that asparagus needs three years just to settle in before harvest can begin, but it's worth the wait he says. Fuji-san embarked on his farming adventure only this past April, and so is a green thumb in every respect. Reading everything he can get his hands on, he studies vegetables and soil in a quest to unlock their secrets. (I can totally relate. There is nothing more mysterious than a growing plant.) Quite wisely he asked some of the neighboring farmers to teach him, and by the looks of the produce he brought along that day and had in the back of his bike he's making them proud. When I asked him why he began farming, Fuji-san replied that he's not working right now and didn't want to waste his time. Laid off from his job as a delivery truck driver two years ago, he's applied for everything and anything but to no avail. He worked for a short time as a cook, but that eventually fell through. (A shame, as the sweet omelet he whipped up for us later in the party was extraordinary.) At 43, he's aged out of the majority of jobs. Most companies, friends later said, won't even look at the resume of someone over 34 years old. His wife is also unemployed, and the oldest of their three children works to pay their way through university. (The latter is nearly unheard of in Japan. Most kids live at home during their university years while parents cover tuition. Student jobs tend to pay for the extra amenities, such as shopping, going out with friends, etc.) They receive food stamps and get by on what comes in from the garden. At some point, Fuji-san became depressed enough to give thought to desperate measures. He got some much needed help and began looking around for positive ways to use his time. Now, his days are filled with sun and dirt with marvelous results. Farming, even on this four meter square scale, seems to have unleashed Fuji-san's creative side. His bike, a homemade fixie with a cell phone holder on the front, push-button directionals, and a cart that I'd give my eye-teeth for is evidence of a kind of skill that can't be taught. While the vocation might be a new one for him, Fuji-san seems to have slipped into it as easily as his toe socks. "You just spread your toes, and you can see where they need to go," he said with a smile. *Not his real name. I'm not sure he'd care, since I'm publishing his photo, but I thought I'd give some semblance of privacy. This is a beautiful story! I love the quote: "You just spread your toes..." He sounds like a wonderful farmer. Loved it! Joan, I'm absolutely in tears!!! what a great post- and what a wonderful thing for "Fuji-san" to have found this new lease on life- with something fulfilling...creating new life in the soil!! Thank you for sharing this extraordinary life story!! Fuji-san's is a powerful story of loss and recovery. Thanks for sharing it so well! Thanks, Motherlogue, for the good words. He's an amazing person, and I feel lucky to have been able to meet him. Such a heartwarming story, and you told it with love. I'm so glad Fuji-san could find new meaning in his life from Mother Earth. Fascinating to read about the lottery for a small patch of land to garden on. It must really make a person appreciate anyything that could be termed abundance. Space is definitely at a premium here, Milli. Just the other day folks stopped by the garden while I was puttering, and asked if I rented. I trade labor for the space, but I'd say I'm getting the better end of the deal, for sure. The farmers are the best, and I learn so much every day. With fresh vegetables to boot! I'll bet the ones who get to trade their labor for some space think they're the ones getting the deal. Otherwise, they might not have an opportunity to grow any food. I'm sure for some it's a matter of survival . . . I imagine it must feel good for you to be able to help.